Flames were first spotted rising from the elevator shaft of the E. & S. Currie Neckwear factory (58 Wellington Street West, west of Bay Street) just after 8PM on the night of April 19th, 1904. 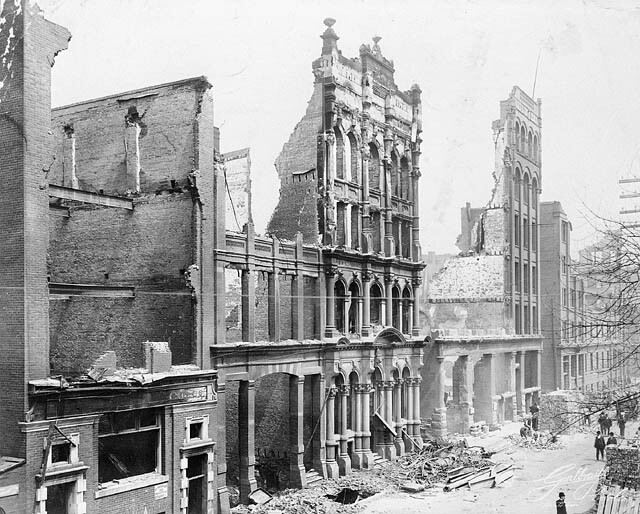 It took 9 hours to get the fire under control, and by the time it was put out, 104 buildings were destroyed, causing $10.3 million 1904 dollars in damage, but no deaths. The fire spread as far south as Front Street, but firefighters managed to keep it from spreading as far east as Yonge Street. Help came from as far away as from cities as far away as Hamilton, Ontario and special express trains from Buffalo, New York. Along with the photos below, the City of Toronto Archives has an insurance map of the fire and more details including a video online here. 1904 Where the Great Toronto fire of 1904 started.